The U.S. National Park Service and Glacier National Park Conservancy joined the A.T. Kearney Student Lab at CMU for its 10th anniversary year. 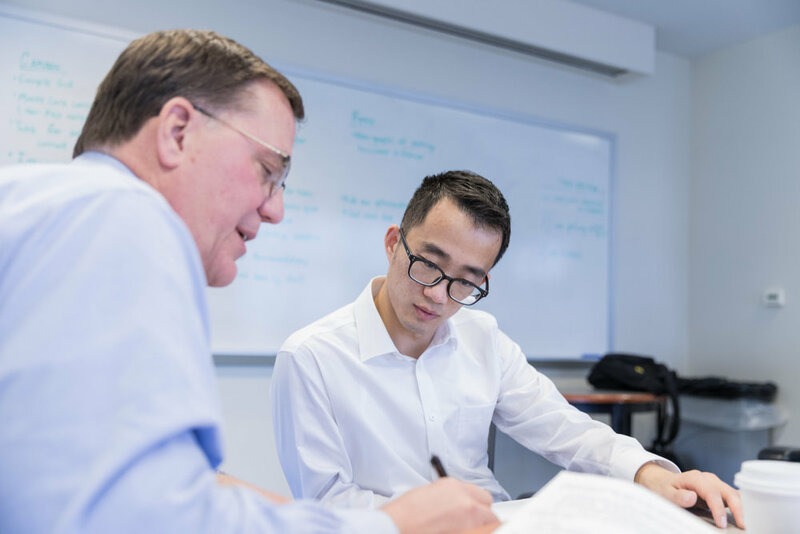 Launched in 2007, the A.T. Kearney Student Lab at CMU gives Carnegie Mellon students the opportunity to work with client companies to address real business problems. Tepper School students enrolled in Strategic Management of the Enterprise — co-taught by Sunder Kekre, Vasantrao Dempo Professor, professor of operations management, and Sham Kekre, Distinguished Service Professor of Operations Management — form consulting groups with classmates and students from the Heinz College and undergraduate programs. Client companies — which this year included ABB, Albertsons, Ameriprise Financial, Campbell Soup, Chico’s, GlaxoSmithKline, Hewlett Packard Enterprise, Janssen Pharmaceutical Companies of Johnson & Johnson, PNC, PPG, Sensei Labs, Siemens and WESCO — present a business case to the student group. Topics are intended to call upon a variety of skill sets, including analytics and communication. This fall, the A.T. Kearney Student Lab at CMU celebrated its 10th anniversary. Joseph Raudabaugh, a partner at A.T. Kearney who launched the collaboration in 2007, spoke at a Dec. 9 cocktail reception in the Posner Center about the history of the partnership. Over the past 10 years, he said, the CMU program had involved 941 students and 51 client organizations — numbers that will increase this fall as the student lab begins its 11th year. Many of the client companies that have been involved with the student lab return year over year; Siemens has been involved since the first year. But this year was the first for Glacier National Park Conservancy. The conservancy supports Glacier National Park, which spans more than 1 million acres in northwestern Montana, through philanthropic efforts, preservation projects, and research and education programs. As a board member of the conservancy, Raudabaugh had encouraged the organization to participate. “We had a lot of opportunities where I saw that leveraging the lab program would be helpful,” he said. “It finally came together this year to participate,” said Margaret Notley, secretary of the conservancy’s board of directors. Notley and Raudabaugh worked with Eric Smith of the United States National Park Service to identify and define a suitable problem to bring to the student group. “In the last seven years, visitation has increased pretty dramatically,” said Smith, deputy superintendent, U.S. Department of the Interior National Park Service. “The timing of the lab was great, because 2017 saw a huge increase. In July of 2017, Glacier National Park had over a million visitors.” The increase in numbers dwarf those of other major parks in the region and even surpass larger parks with more infrastructure to handle the visitation like Yosemite and Yellowstone. Planners determined that the road must travel through Logan Pass “because it provided a south or west exposure, which meant the road would be in sun and out of the shadows of surrounding peaks,” Houk writes. Logan Pass is the point of highest elevation on Going-to-the-Sun Road and sits on the Continental Divide of the Americas, the hydrological divide underlying the Rocky Mountains in North America and the Andes in South America. The visitor’s center at Logan Pass is where most day hikers park, and the National Park Service website advises visitors to use free shuttles rather than parking in the already full visitor’s center lot. Smith said that the National Park Service has been working on a corridor management plan for several years to handle the growth in visitation to the park. “We had anecdotal observations that we didn’t really have good data or any kind of simulation to validate,” he said. Notley and Smith came to campus in the fall of 2017 to introduce the problem to the Strategic Management of the Enterprise course. Students were given the opportunity to rank the projects they wanted to work on among more than a dozen options, and were assigned into groups based on their preference. The team assigned to the Glacier National Park project — which would come to be known as Project Sunbound — included MBA students Camden Cornwell, Yi Zhu, Kyle Holmes and Alex Corn, and Heinz College students Rohit Reddy Tippani, Banu Prakash Nallani and Prajakta Kemkar. When Smith presented the problem to the student group, he intentionally avoided reporting on the solutions the park service had already considered. “We really wanted to challenge their innovation and let them look at their own ideas.” The park had worked with universities in Montana, which involved researchers who were already familiar with the park and came with preconceived notions about what should happen. Project Sunbound included two separate paths of analysis, Cornwell said. Zhu developed an optimization model to seek an operational solution to the congestion issue, while Corn created a virtual simulation tracking traffic and parking patterns. “One of the great things about the project is that the data was public,” Cornwell said. “It was incredibly well-organized, right out of the gate.” He noted this was not the case for many of his classmates working with private companies, which often take longer to turn around proprietary information. At Project Sunbound’s final presentation to Smith and Notley on Dec. 8, Zhu presented the optimization model he and his teammates built to demonstrate the effect of implementing metered parking. Requiring visitors to pay for parking, he said, would reduce their parking time and consequently increase turnover, meaning that the park could more readily accommodate the increasing numbers of visitors. Project Sunbound worked with software from AIMMS, which Smith reported had reached out to the park service about continuing to provide data analysis services. Smith noted that the park lacks staff with the programming knowledge necessary to harness the software, and he would like to continue to work with business students to address congestion issues: While Cornwell and his team focused on the primary road, Smith said there are three other areas in the park facing serious congestion issues. He also would like to optimize the park’s operations and staffing. Notley also reported that Glacier National Park Conservancy had benefitted from the students’ work. “We also gained some insight for our own organization and operations in terms of the retail traffic,” she said. The conservancy worked this spring with the A.T. Kearney Student Lab at Northwestern University’s Kellogg School of Management to improve its reach. Raudabaugh said that, although the park sees more than 3 million visitors each year, the conservancy has less than 6,000 people on its donor list. The Kellogg group analyzed ways the conservancy might be able to increase its reach. For Cornwell, the experience was a significant opportunity to practice managing clients and projects. After earning his MBA in May, he moved into a career as an investment banker with Houlihan Lokey, the top adviser for mergers and acquisitions and for global restructuring in the United States.